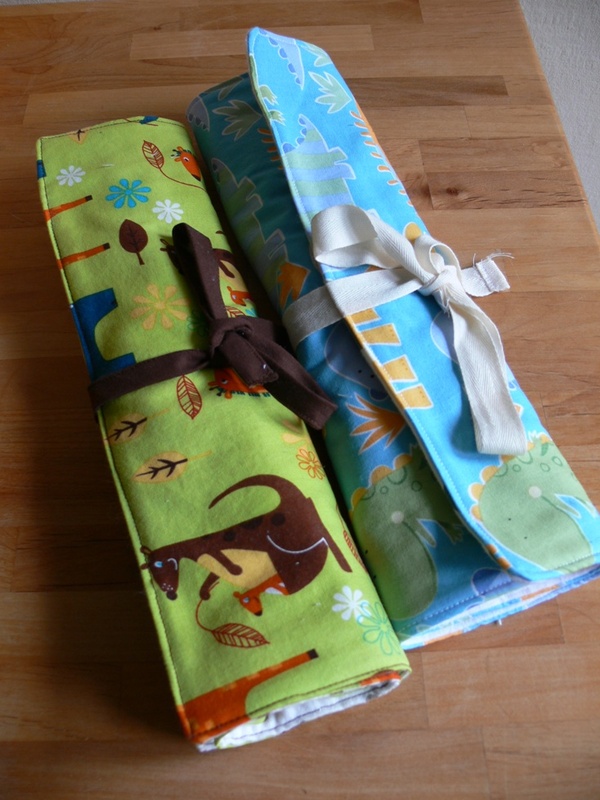 And here's more baby stuff! 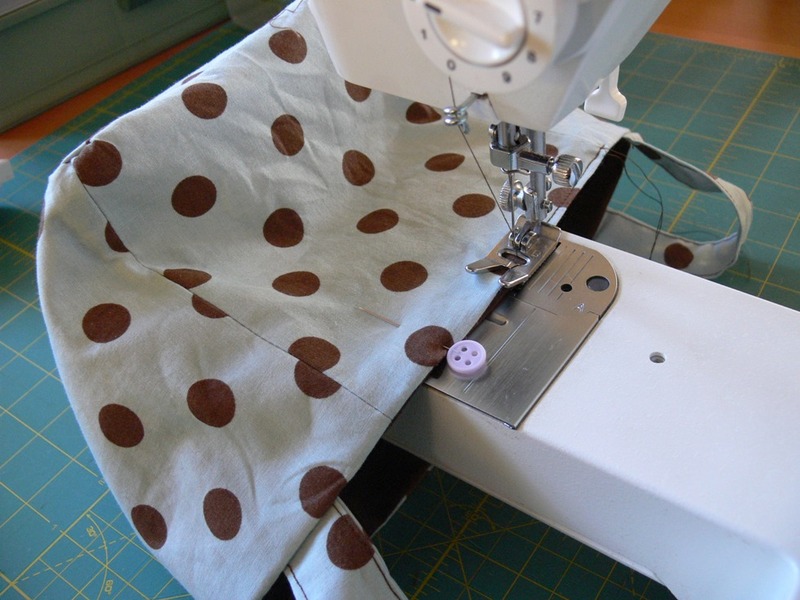 Until the crazy snow storm stalled my labor-inducing efforts, I was feeling quite restless and keeping busy at the sewing machine. 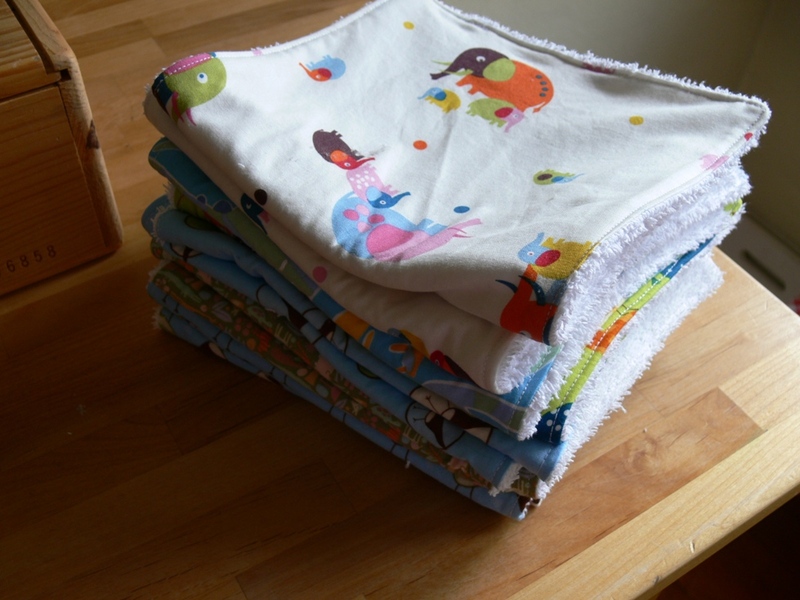 Last week, I made 2 diaper changing pads and a dozen burp cloths. They're nothing fancy but will come in super handy on a daily basis. It felt like a great project to complete! 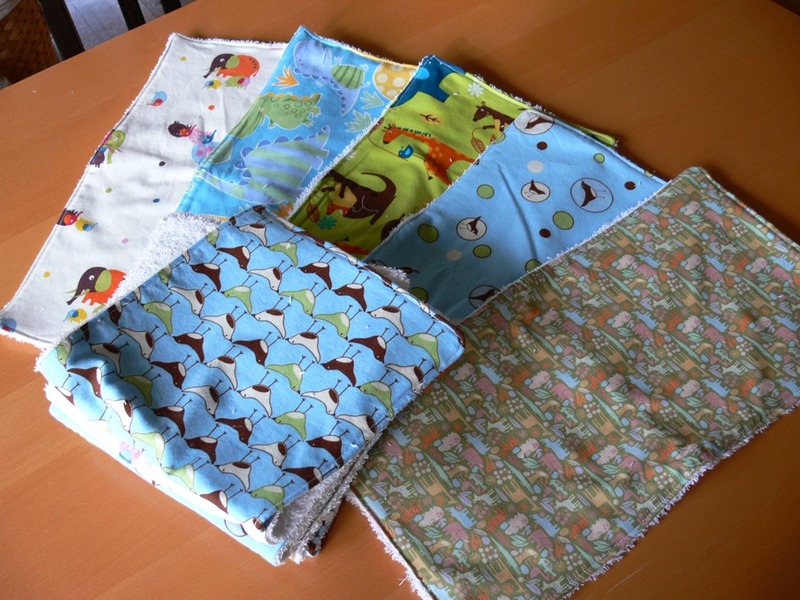 For the burp cloths, I followed the Juicy Bits pattern I have made several times before. 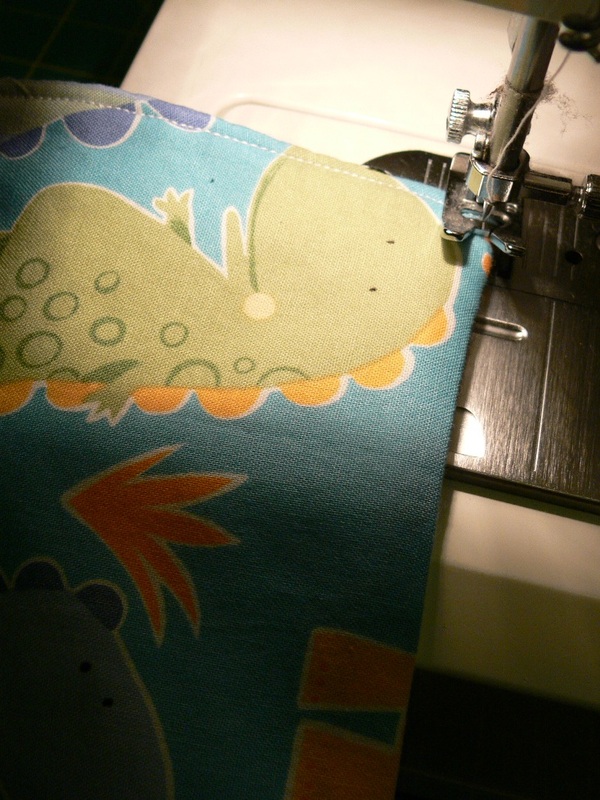 A layer of cute fabric on one side, a layer of thick terrycloth (repurposed towels!) on the other, boom, done! 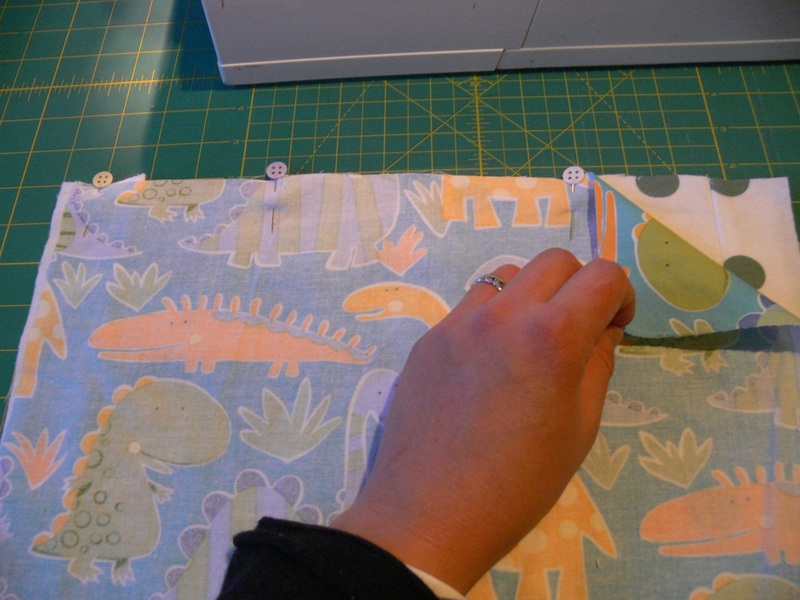 For the diaper changing pads, I copied a pad my sister handed down to me, which is very practical but looks a bit girly. 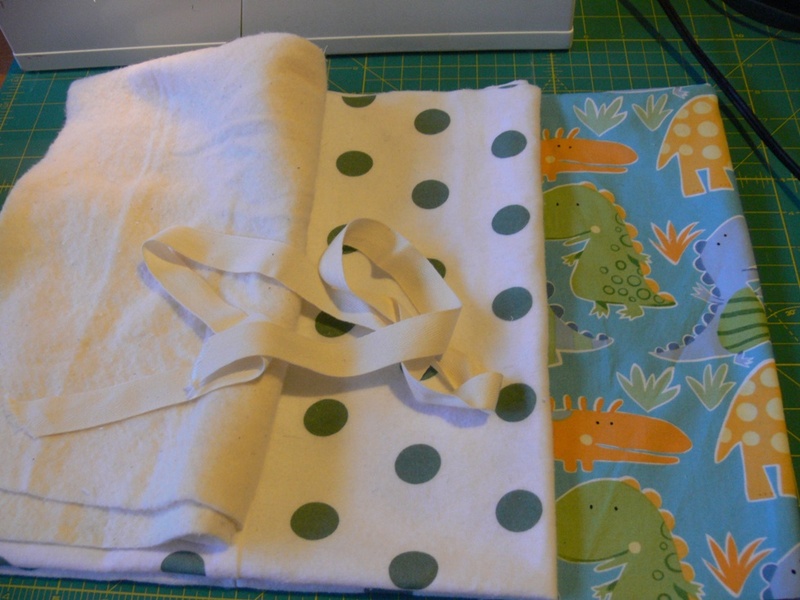 I cut a 24 x 14 inch rectangle out of 3 layers: cute fabric for the outside, flannel for the inside/baby changing side, and a layer of batting. 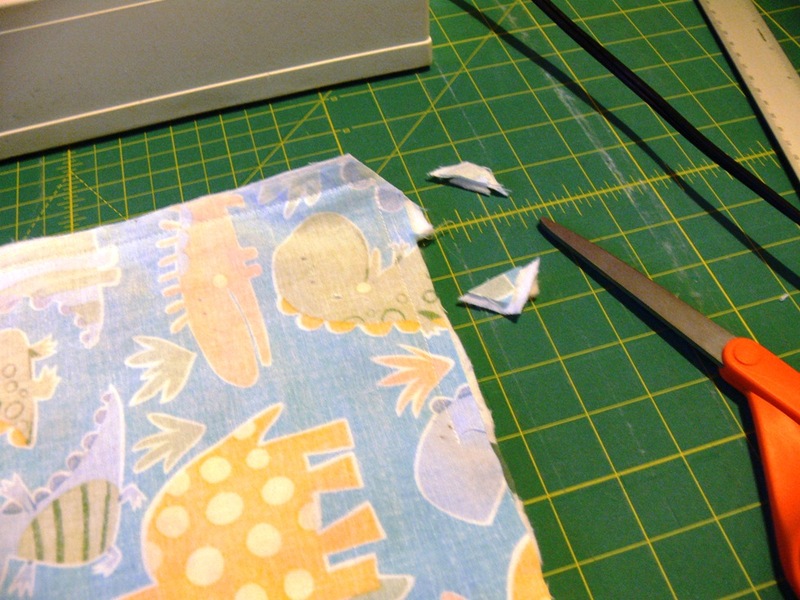 I also cut a 30-inch piece of ribbon that I folded in two, for tying the diaper pad closed. Here are a few pics that show the process of making these. As you can tell, I used fabric I had on hand and didn't have quite enough flannel for these, so I added strips to the side to have wide enough pieces. 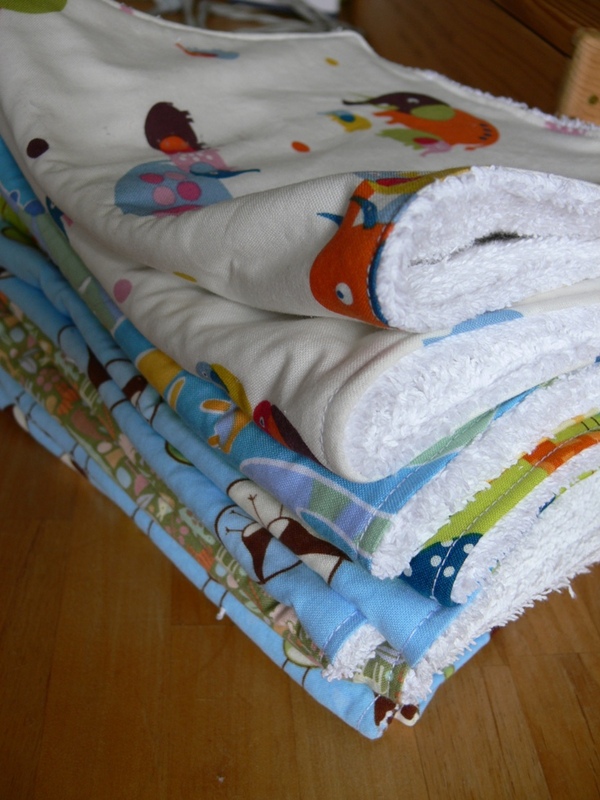 They are so soft, I think they will be lovely to keep baby cozy during diaper changes! Jenny, I have been sending "Wait baby wait" vibes to Seattle since we talked yesterday! I would be going stir crazy too, hang in there! I made a small doll quilt right before going into labor with Silas, I love being able to fall back onto creating when I am stressed. The changing pads and burp cloths are so colorful! 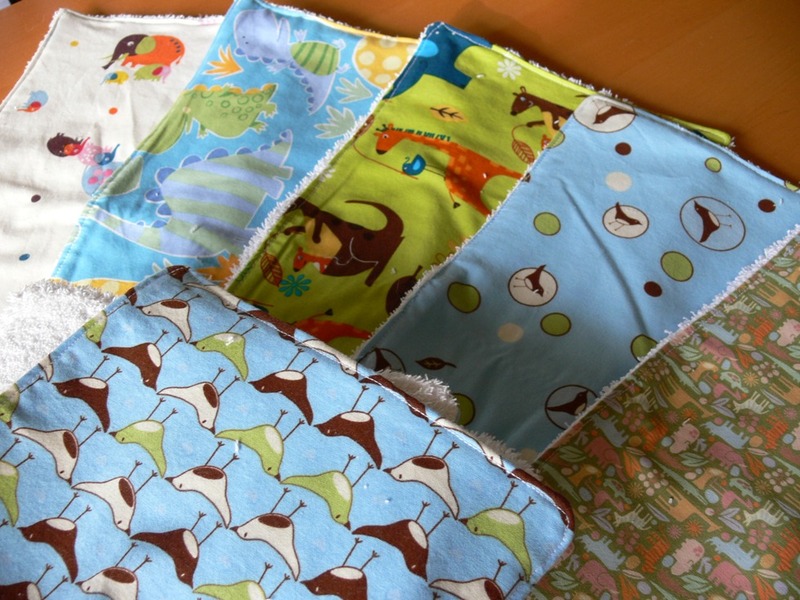 I loved the burp cloths you made for me, I had a similar idea for a changing pad based on one Angela made me when I was pregnant with Ian. It is the same exact concept, just terry cloth instead of flannel. What a great way to re-use towels, and I thought vintage sheets might make a good backing for them! Here are some cute Fall and Thanksgiving links. - The Crafty Crow posted a bunch of turkey crafts this year and last: "The biggest list ever of turkey crafts for kids to make" and "12 turkey crafts for kids"
- Whit's Knit Winter Hats at the Purl Bee... These are making me want to knit some cozy head gear! Here's another project I've been working on while awaiting baby's arrival. Since I'm almost 40 weeks pregnant, everything is done at a bit of a frantic pace lately and centering around this pending event... It's a bit stressful and exciting all at the same time! I've been wanting to finish this knit blanket (yes, another blanket with which to cozy up this winter!) before he arrives and I'm cutting it very close. 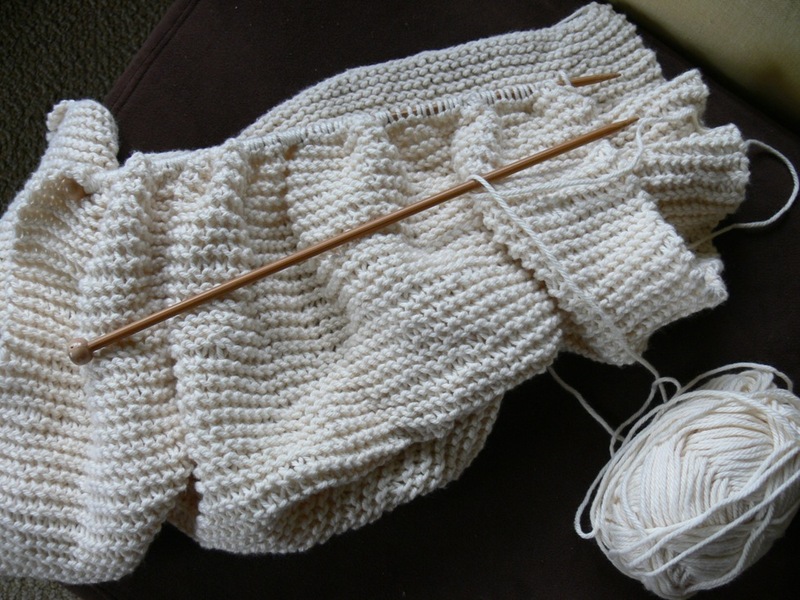 I am making the Garter Stitch Blanket from Special Knits by Debbie Bliss again. 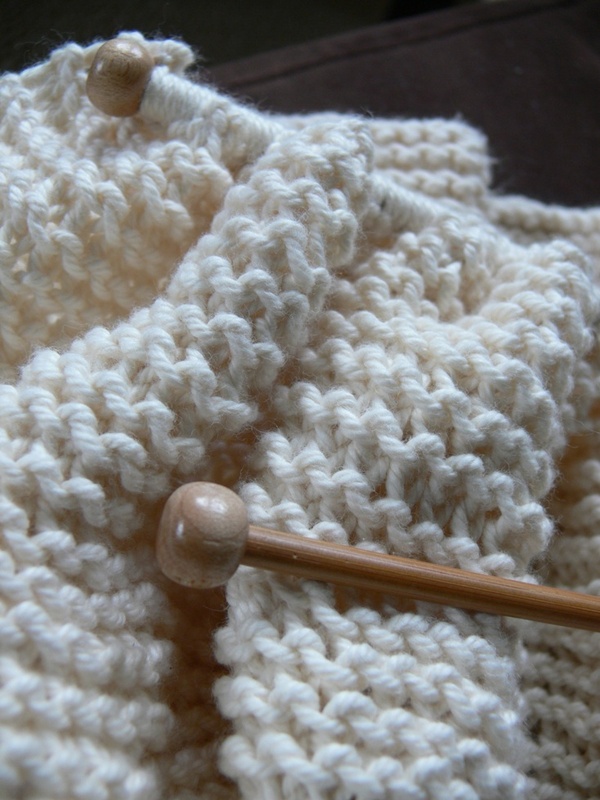 I really loved that project and it is a wonderful mindless TV-watching knitting project. Perfect for end of pregnancy! I've been taking it with me everywhere lately and hope to have the knitting part done within the next day or two. Fingers crossed! 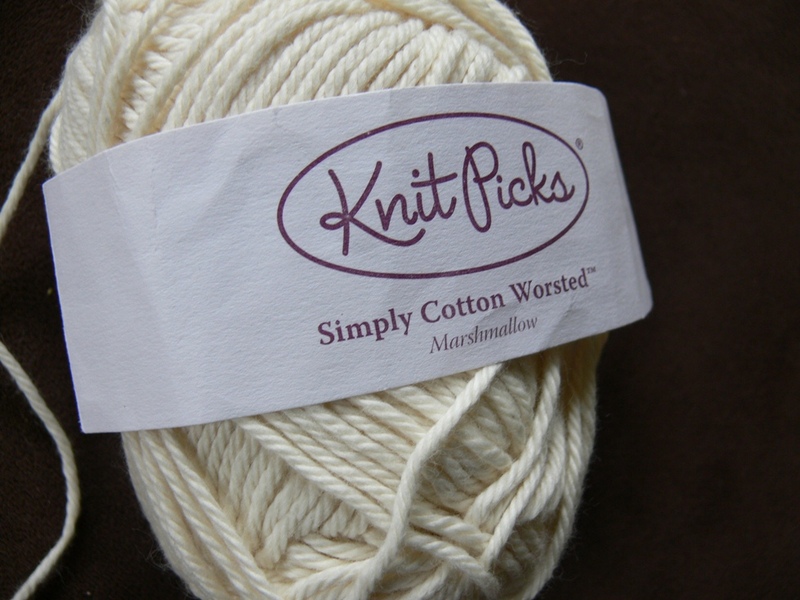 I'm using an organic cotton yarn: Marshmallow by Knit Picks, in worsted weight. It takes exactly 3 skeins to make this blanket. It's the same yarn I had used for Silas' grandpa sweater, I had used Ginger for that. It's so lovely to knit with and I'm so happy about using organic fibers for something with which we will snuggle our baby boy. So, I'm close to done but I'm stuck on the binding. 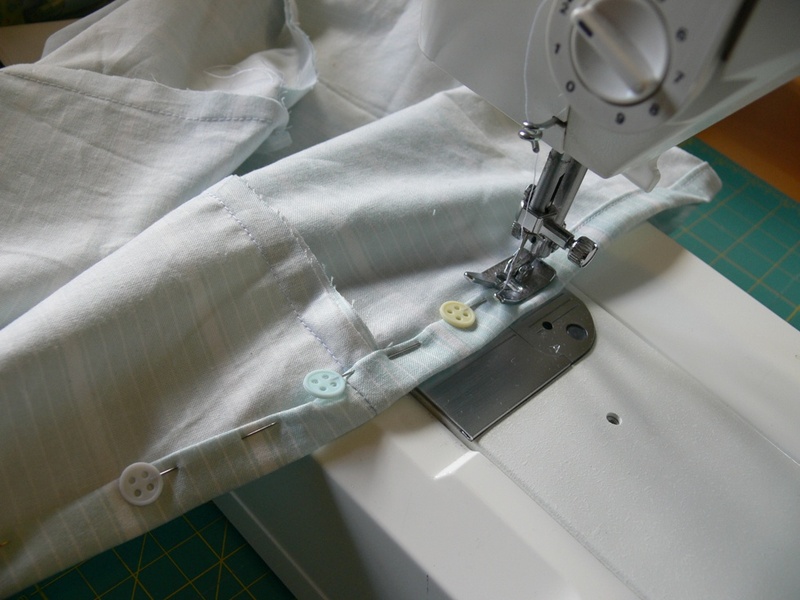 I'd like to use an interesting fabric again, instead of the satin ribbon used in the pattern. But what fabric to use??! 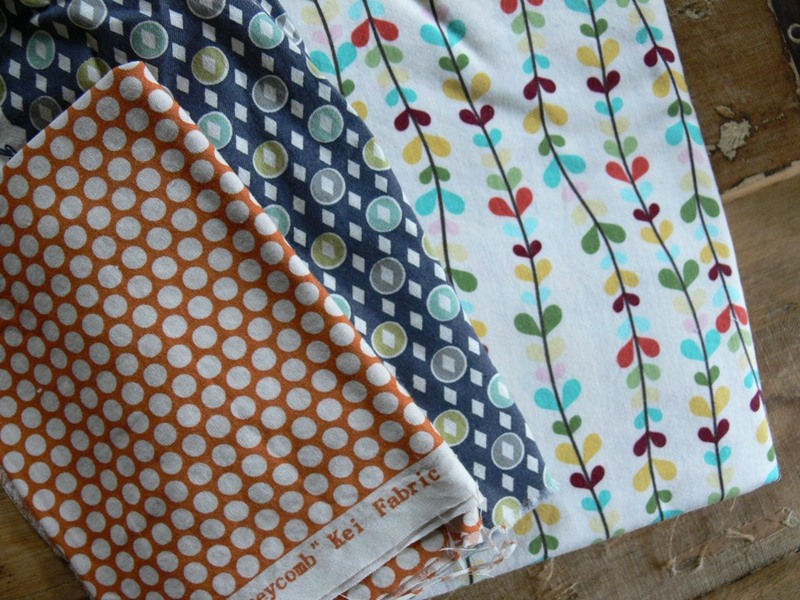 I thought about maybe ordering some organic fabric from the Happy Nursery line (I like the Leaves in Sky print), but I can't find it anywhere local and time is an issue with shipping. Here are a few prints that I thought could be potential. But eh, I don't know. I only have enough of the Riley Blake vines and I feel like that is too girly. The other two prints feel too modern or grown-up. I am envisioning something a bit more "earthy" and whimsical, involving some of that cream color to tie it all together. I am heading to the fabric store tomorrow and hope to find something suitable so I can finish this project. Wish me luck! Hello friend! Tick tock, tick tock, we are (hopefully) only days away from welcoming our newest addition. I feel like I've already slowed down quite a bit on making and posting here, and it's partly due to feeling so exhausted and overwhelmed, and partly due to Ben deciding to drop his awesome afternoon nap! I am not ready for this! Needless to say, it has drastically cut my productivity lately. 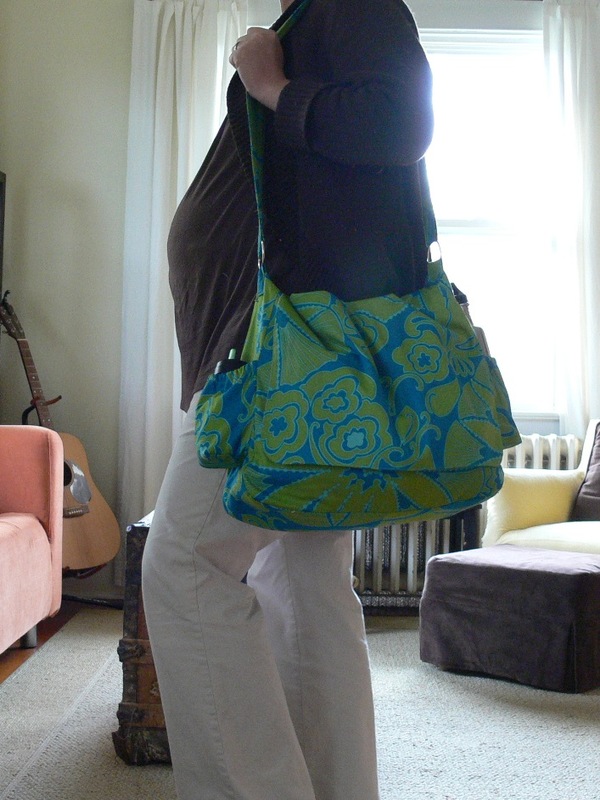 Fortunately, he still sleeps a couple of times a week, and today is one of those lucky afternoons, so, without further ado, I thought I would post pics of my diaper bag!! 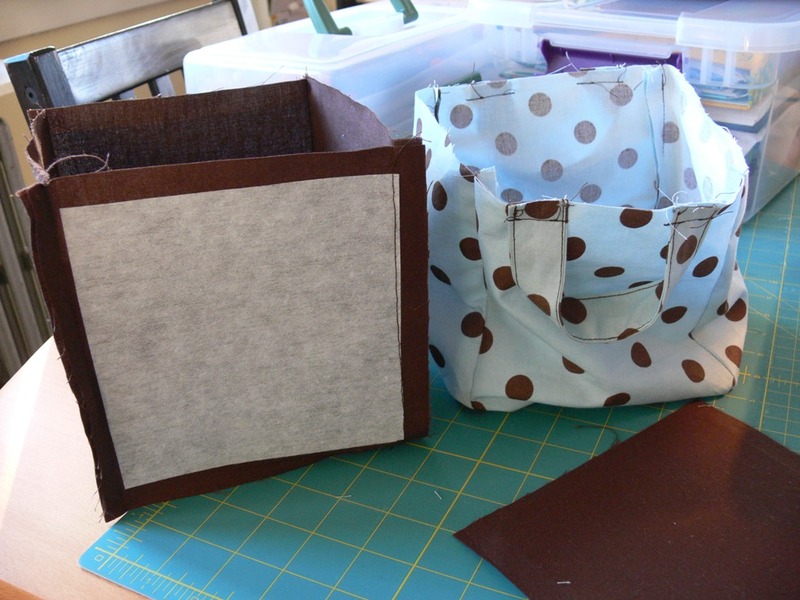 When we did our little "Guess The Project" Giveaway, I told you that I was making the Dad Bag from Anna Maria Horner's Handmade Beginnings with a few modifications to make it mommy-friendly. 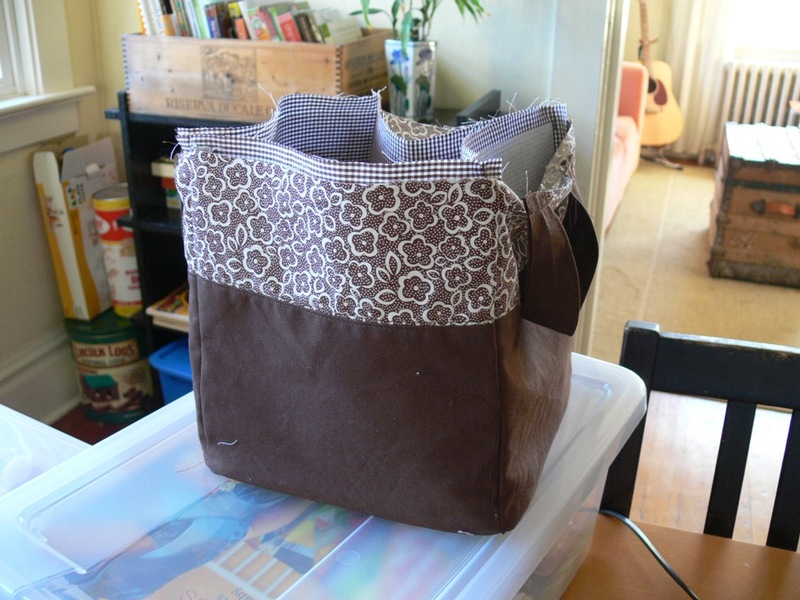 This turned out to be a bit of a grueling project, both because of the aforementioned dropping of the nap and thus severe reduction in free time during which to make this bag, but also because of my vision for the modifications and some sewing machine issues. Anyway. It's done now, and before baby is born. I guess that's what matters! If you or our readers are interested in more details, I can post about each of the specific modifications I made, since I took photos of the process and wrote down notes. In the meantime, here's a list. 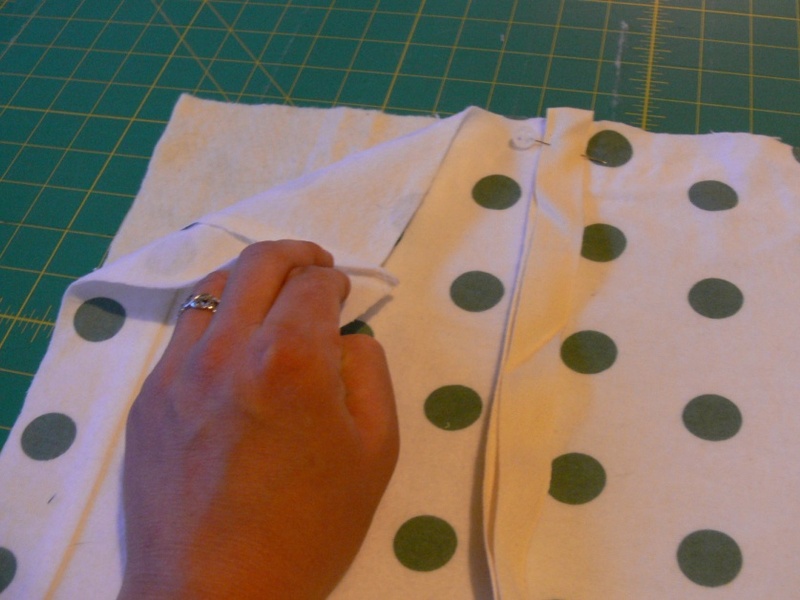 - I made the Continuous Side (the strip of fabric that creates the bottom and sides of the bag) 1 inch wider. 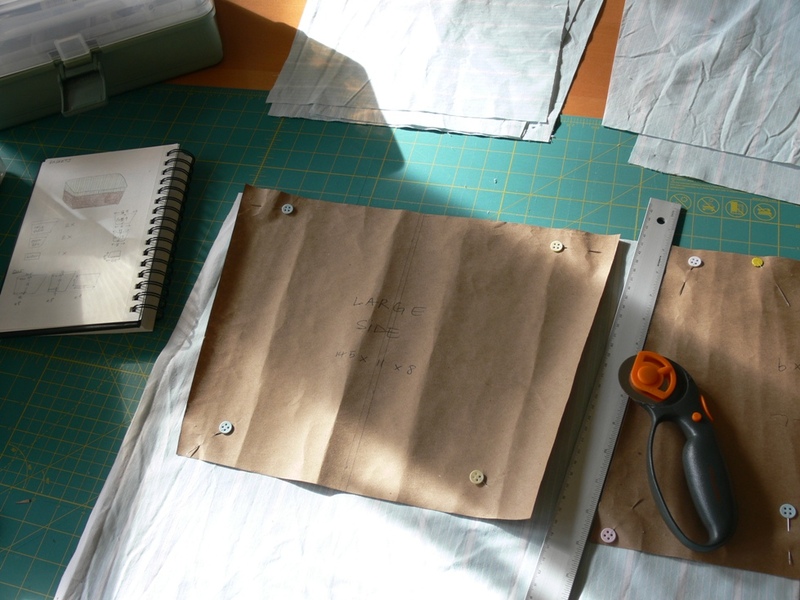 - I added interfacing to the Continuous Side Lining and to the Front Lining (as opposed to just the Back Lining). 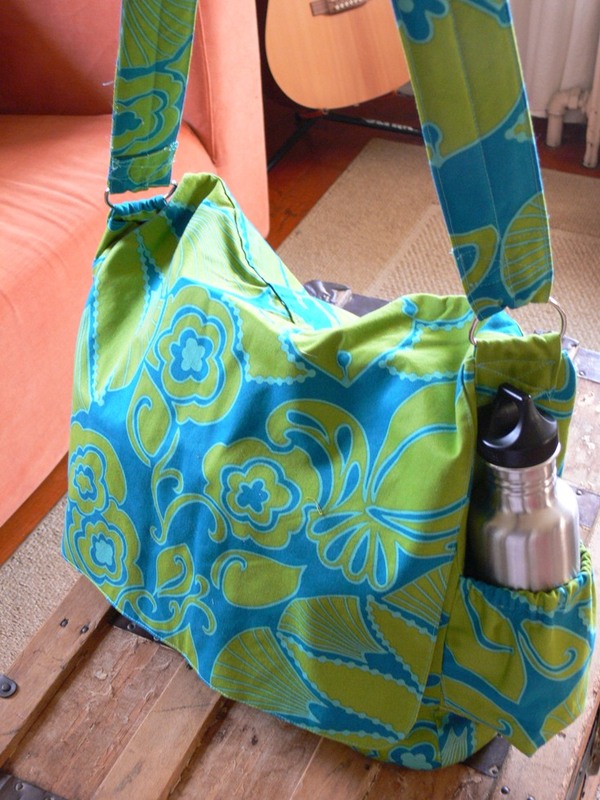 - I added 2 pockets for water bottles on the outside. 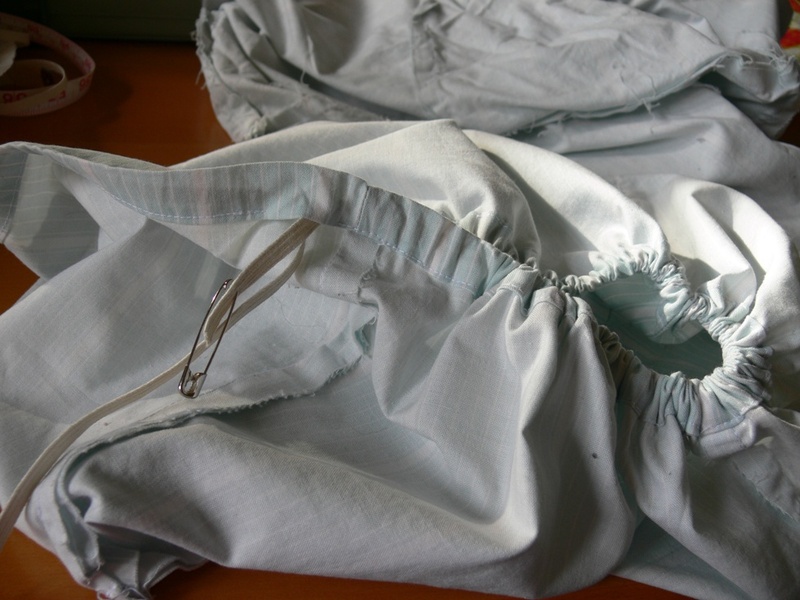 They are lined with laminated cotton and have elastic at the top. - I added 2 small pockets that close with velcro to the Outside Front for small items like pacifier, cell phone, antibacterial spray, etc. 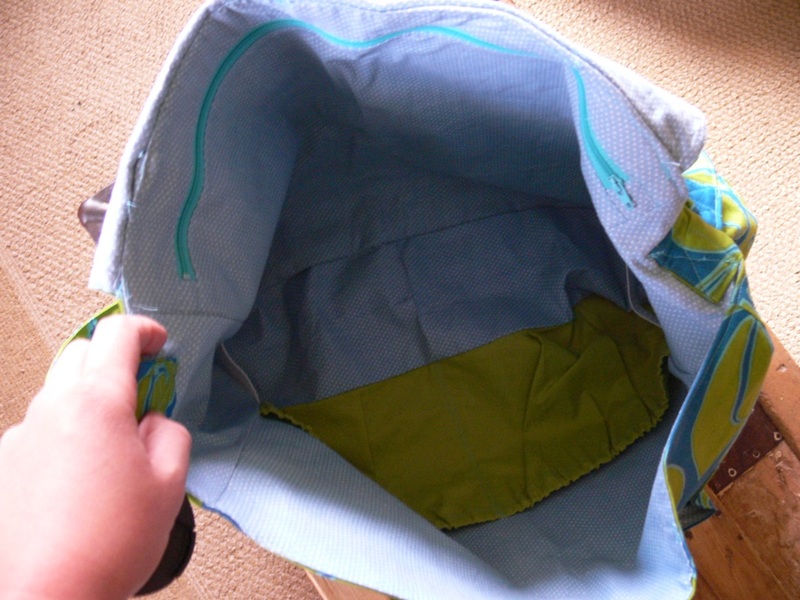 - I added a large zippered pocket to the inside of the bag. It features a key ring. 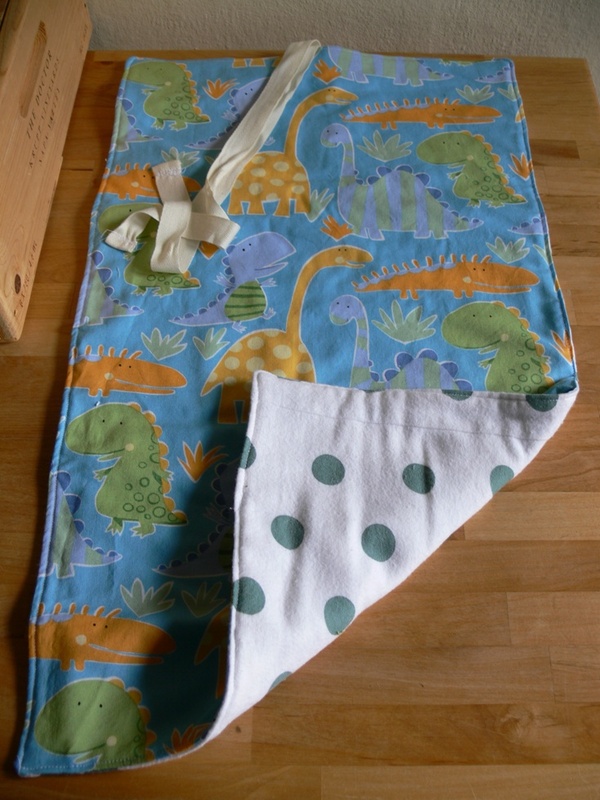 - I made 2 elastic pockets on the inside for diapers and such. 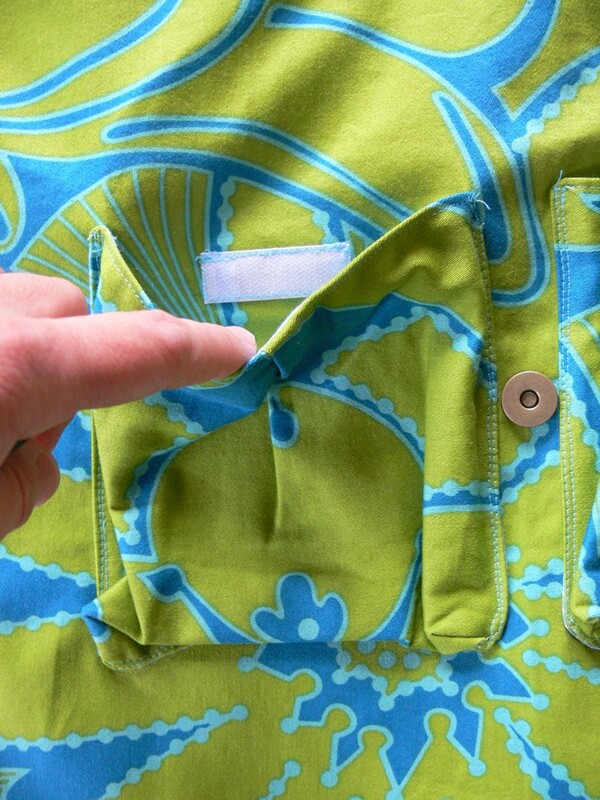 - I added a magnetic snap to the Flap and the Outside Front. 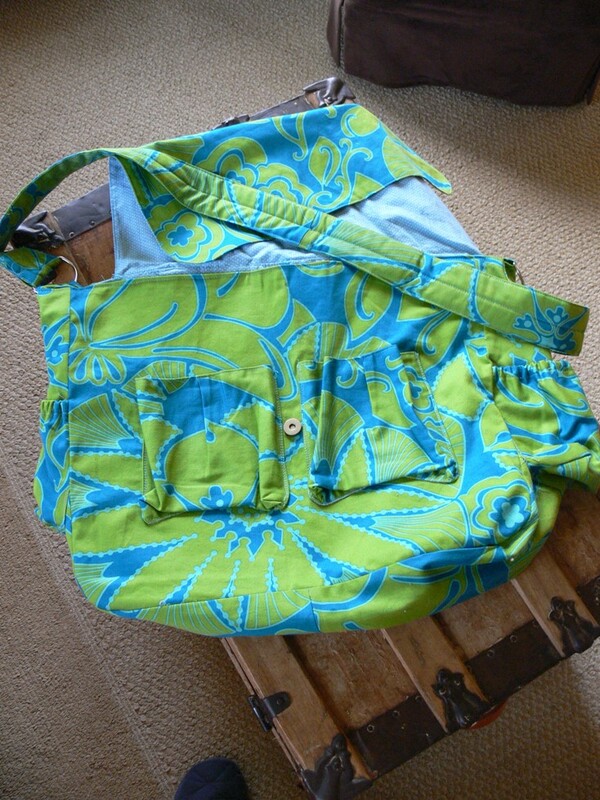 - I made the shoulder strap out of fabric and several layers of batting for padding. 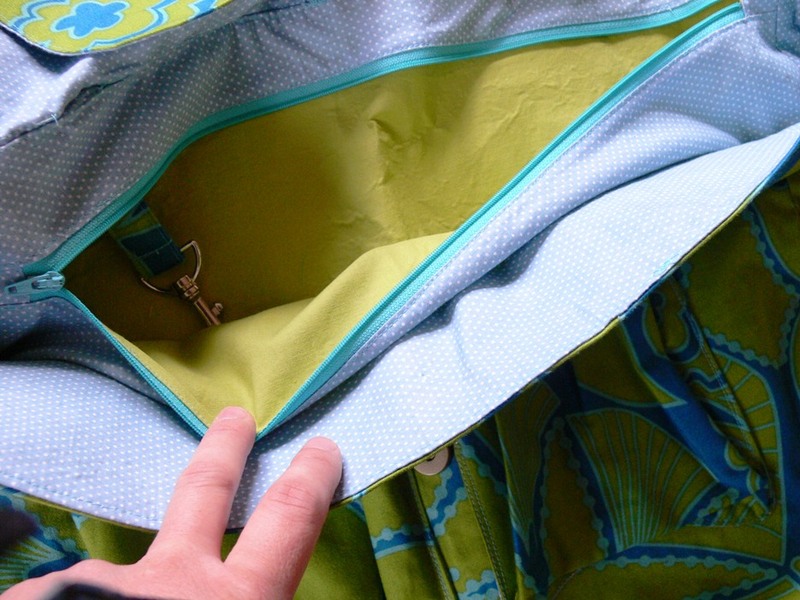 - I did not make the zippered pocket on the Flap. 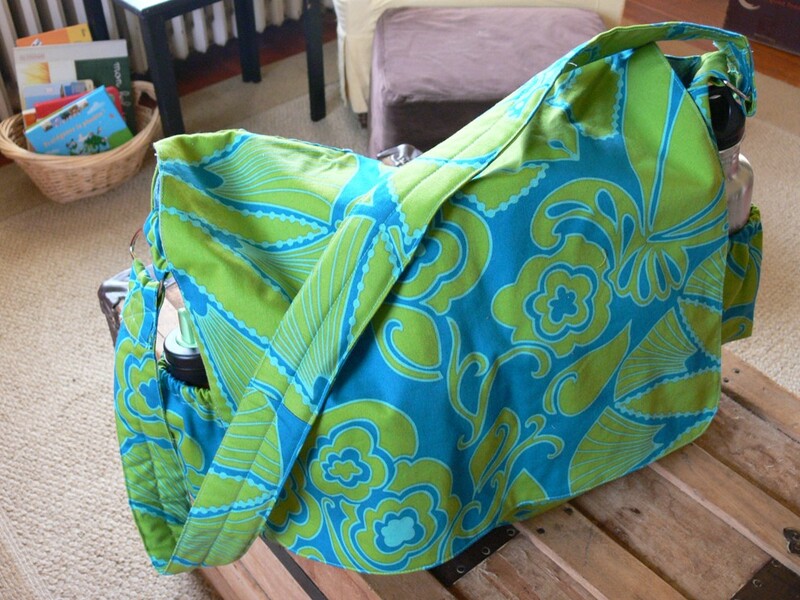 - I did not sew elastic to the inside of the bag for holding items and bottles, aside from 1 piece on each end. I think that about covers it. Here are a few photos of my modifications. I was shocked by how HUGE this bag is. I was not expecting that, but as I started filling it up, I remembered how much crap I lugged around on a daily basis when Ben was a baby. 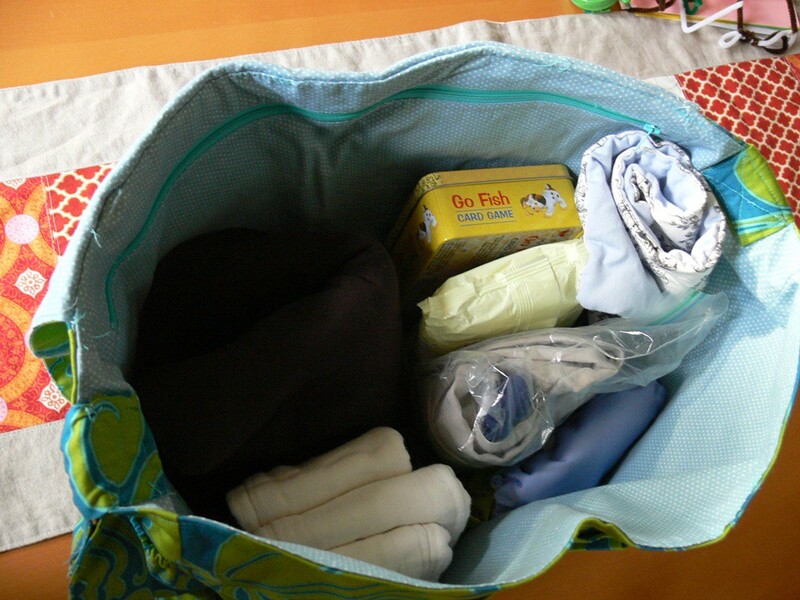 Here, I filled it up with the Moby Wrap, a few cloth diapers, a changing pad, some wipes, a change of clothes for Ben and a game of Go Fish! There is still a ton of room left. I absolutely LOVE the way this turned out Jenny! The fabric is just perfect. You are going to be well prepared when you start taking both boys out into the world! It's so important to have a place for everything, especially with a newborn and a toddler. Ian was older than Ben when his baby brother arrived, so I didn't have to carry much for him when we went out. Can't wait to see this baby! Hey there Jen! Hope you are doing great and enjoying these last few weeks of being a family of three! Every morning I wake up wondering if today's the day I'll finally get to see that sweet baby's face! 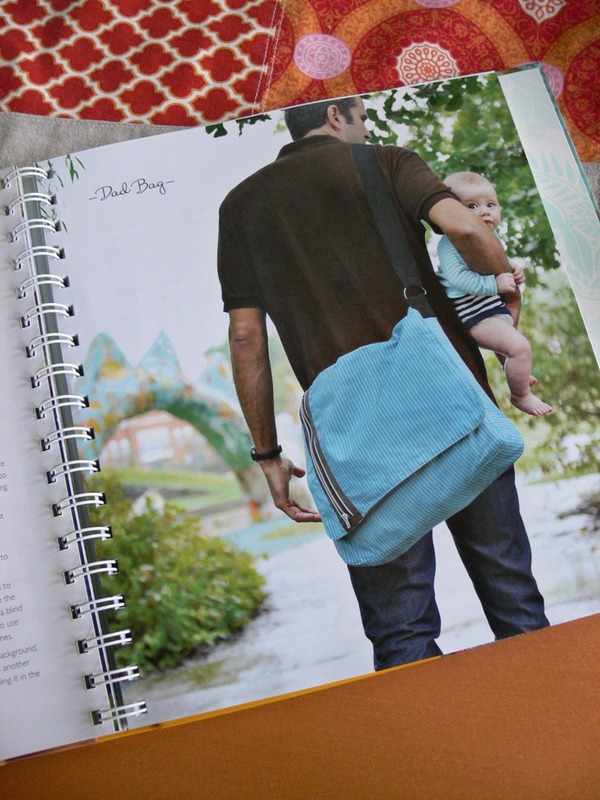 How is the diaper bag coming? I am at my desk this morning making lists and trying to organize myself for the holidays. I really want to focus on using the supplies I already have on hand this year, so I thought it would be smart to write it all down so that I have a good reference when I start my brainstorming. My job now is to find cool projects I can make with what I've already got! That's a pretty awesome list of supplies! I am sure you're going to come up with all kinds of cool projects, can't wait to see!! As far as my supplies go... 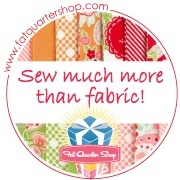 I have tons of fabrics in the stash, still. 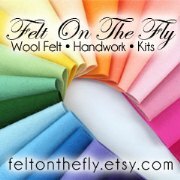 Lots of yarns in different colors, fibers and weight; all sorts of paints, glues, papers and cardstocks; and mason jars. The rest escapes me, but I know there is more. Baby is due ONE WEEK from today, and my holiday craft plans are... non-existent! 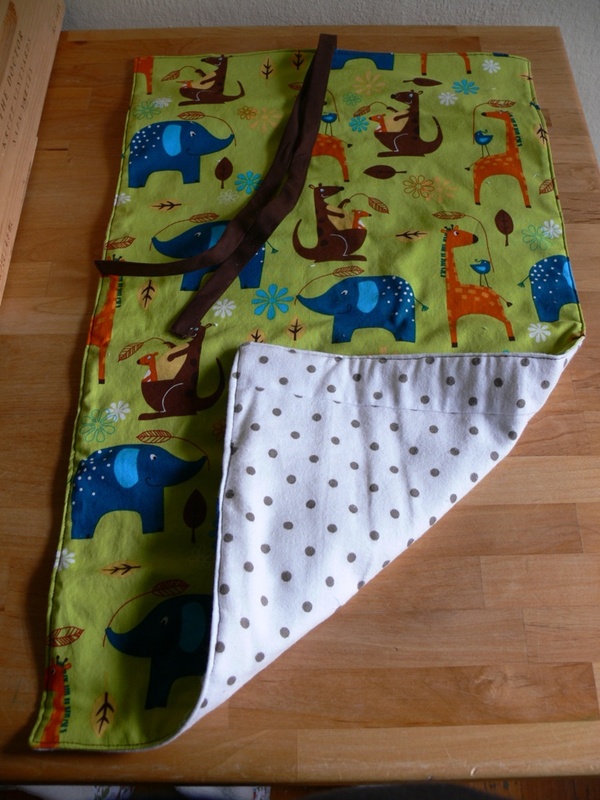 As soon as this baby arrives, I am expecting not to have any time to get anything done, so I'm giving myself a pass on handmade gifts this year (I am very sad about it, but I'm trying to be realistic). 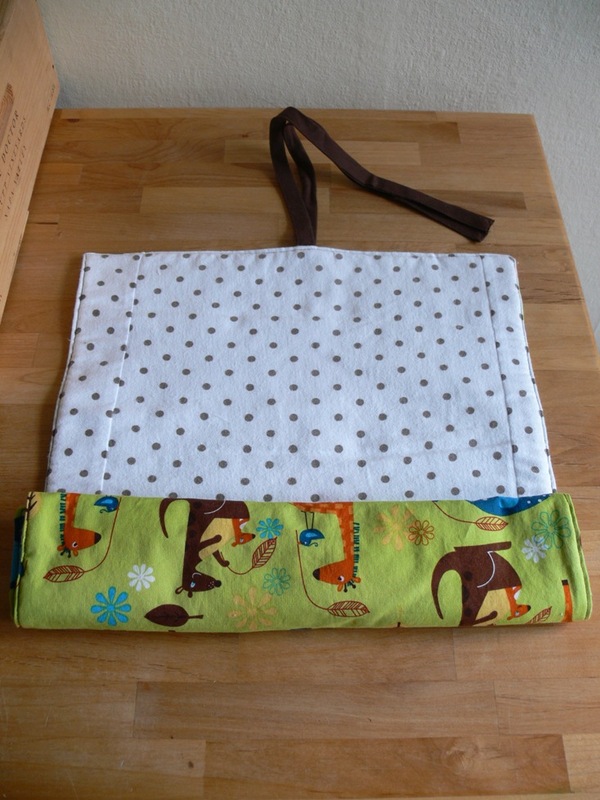 Instead of making headway on Christmas gifts in the last couple of months, I've been frantically making stuff for this baby: the diaper bag is done as of yesterday and I'll post about it asap, I'm knitting, and sewing some more and will share all that stuff soon. So, today I'm on a search for some applique tutorials so that I can figure out how to piece together my Solstice calendar. Here's what I've found so far! Some are not related directly to my project, but they are applique tutes nonetheless. Share any links you might have in the comments, readers! I've got my pieces somewhat arranged, I hope to tackle (and mostly finish) this by the end of the weekend! 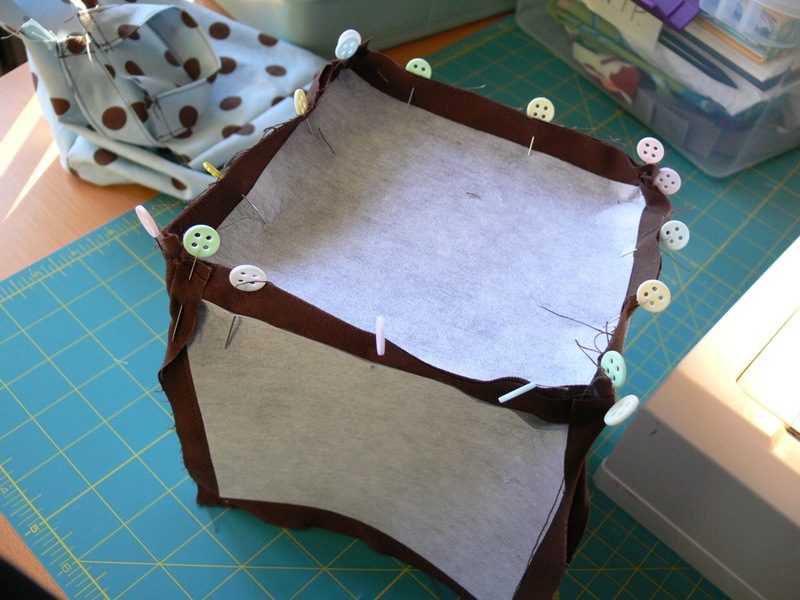 As my due date approaches, I feel like my projects veer increasingly into the "practical and boring" category. Sorry! 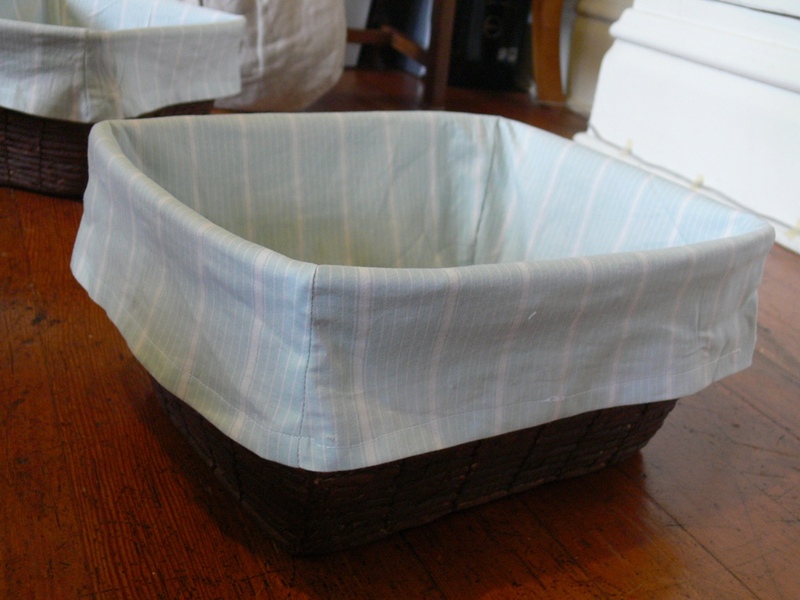 I still wanted to share with you what I worked on last week: some cute fabric baskets to stock our diapering accessories. 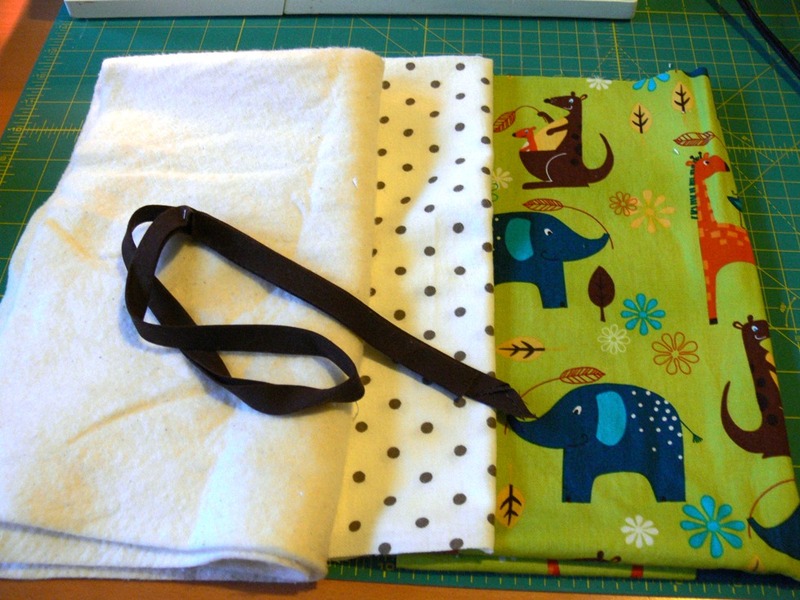 We'll most likely be cloth-diapering this little one and I needed containers for wipes and diaper covers. 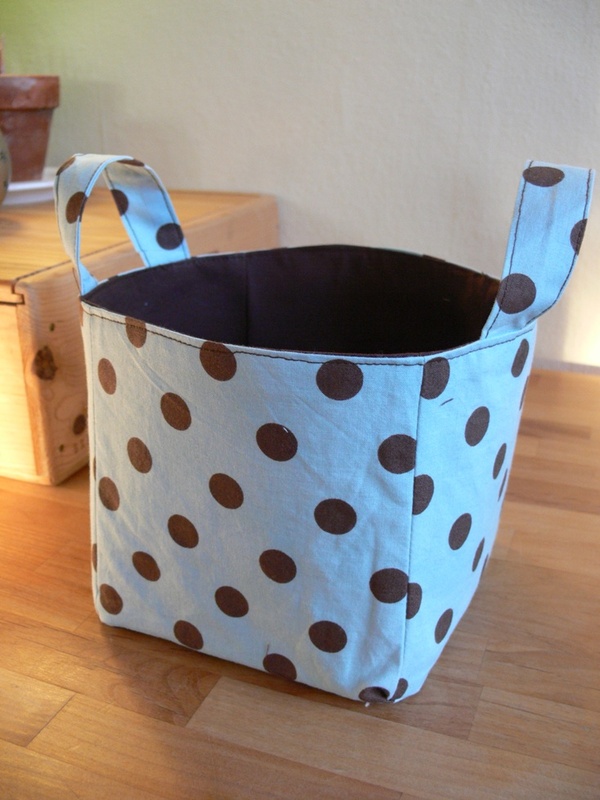 These fabric baskets are super easy to make and there are tutorials for them all over the internet. I winged it as I often do and they turned out fine. 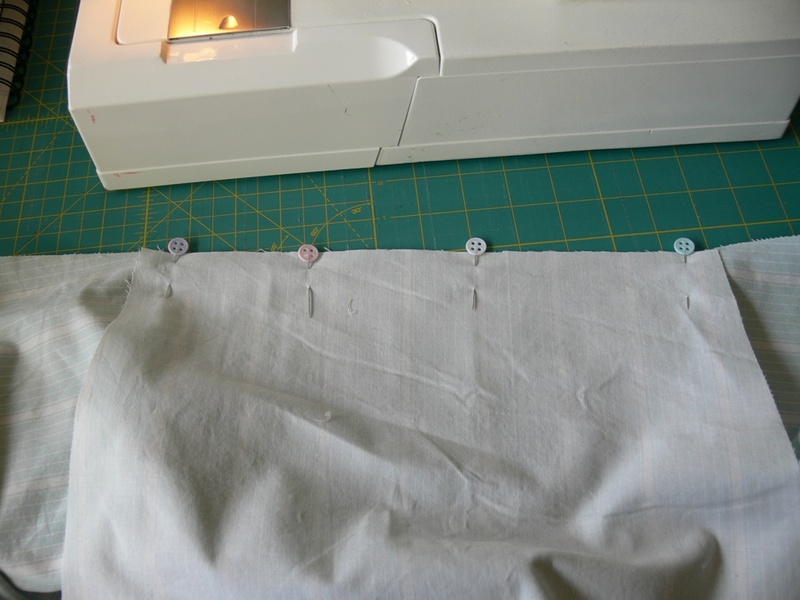 I used the heaviest interfacing I had for the sides and I am not sure it was heavy enough, but it'll do! The baby will sleep with us for some time and we've set up the diaper changing station in our bedroom, so I used scraps and pieces of fabrics that I used in other bedroom decoration projects to give it a somewhat connected look. You'll recognize some prints from my burlap art! 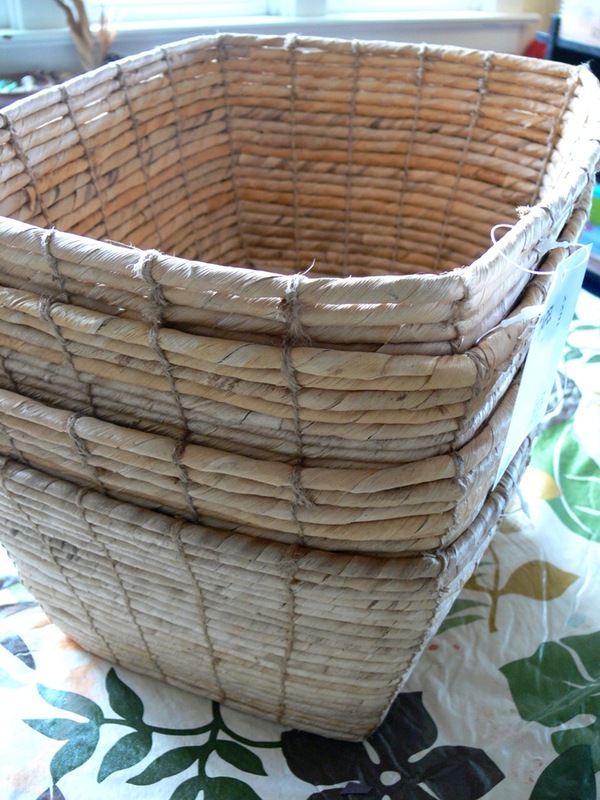 I made and finished these two baskets in one afternoon. The bigger one is 7.5 x 7.5 x 7.5 inches. The smaller one is 5 x 5 x 5 inches. I think the smaller one holds its shape better. I made the handles on the bigger basket too long and they are floppy. Altogether, I'm pretty happy with the results -- and how quickly they came together! These will definitely be used a LOT! Jenny you are on a roll! 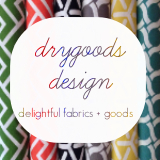 The fabric is great, and like you say, you will use these A LOT!!! Great job! 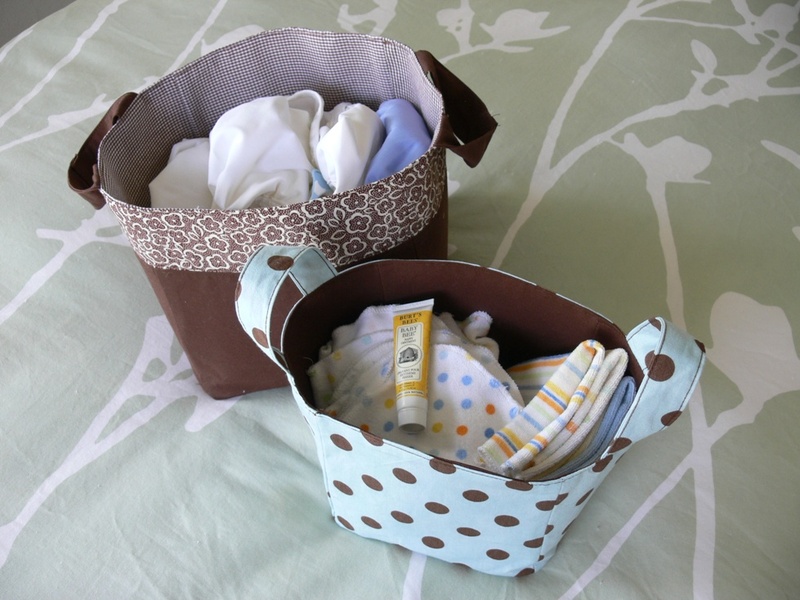 One of the nesting projects I tackled last week was to make some baskets baby-ready. When we moved into this apartment in Seattle (a rental), we agreed not to buy any furniture to fit the space, but instead to make do with what we have. In terms of storage for baby stuff, this means we are having to use open shelving instead of drawers, hence the need for baskets. 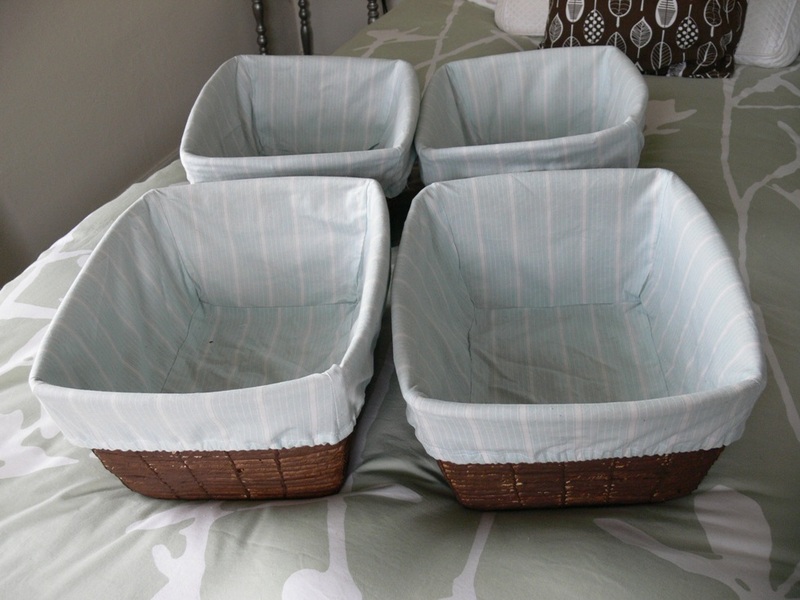 I found some great baskets in the perfect size at Ikea, when we went to purchase Ben's big boy bed and the baby's crib. The price was right, the quality was good and the size was great. We bought 4. After a few weeks of seeing them in a corner of our bedroom and thinking it over, I decided the natural color was all wrong. 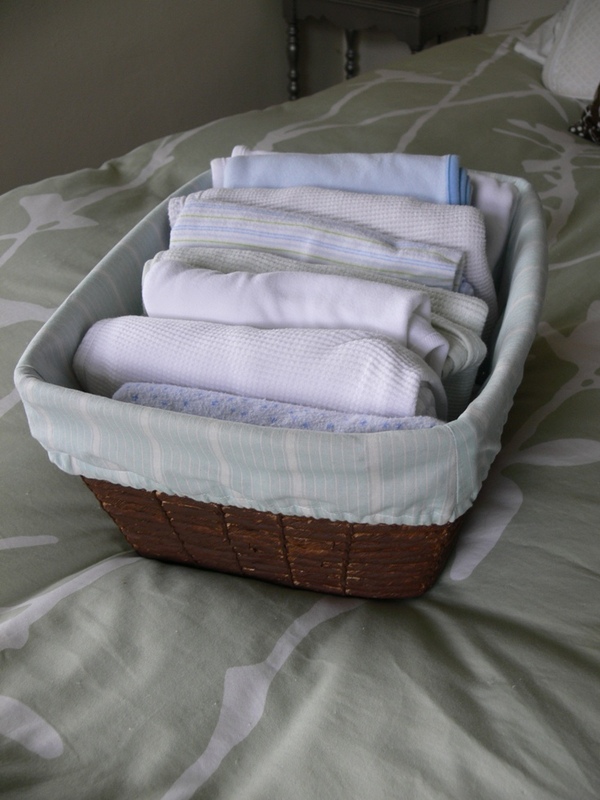 Plus, I wanted a washable layer between the baskets and newborn clothes. 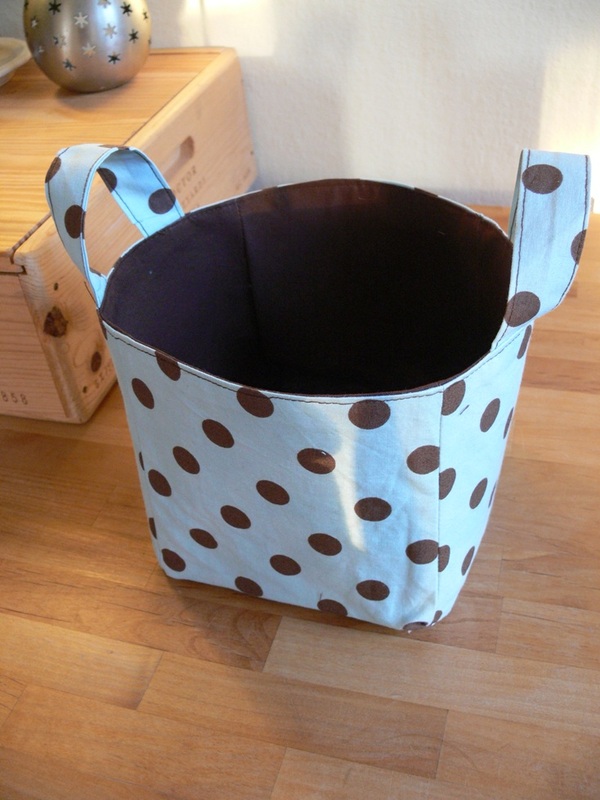 Instead of looking for new baskets, I figured I would paint them a darker brown and make some fabric liners. Kind of a boring project, but a quick one with practical results. 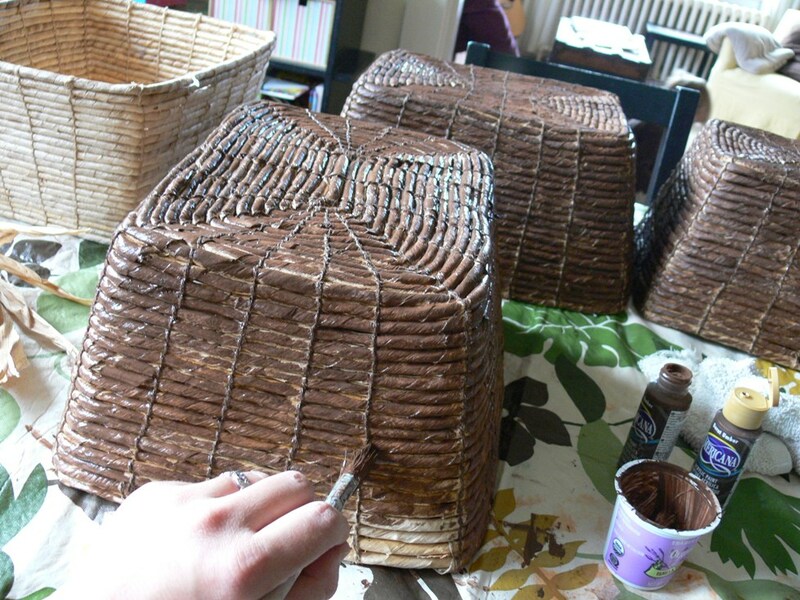 I painted the baskets with a chocolate brown acrylic paint thinned out with a bit of water. I probably needed an extra bottle of paint to get full coverage on the baskets, but eh, good enough. I measured them, then drew and cut a basic pattern for the liners: a panel for each surface with about 3-4 inches extra at the top for a border. I am happy to report I used fabric from the stash! 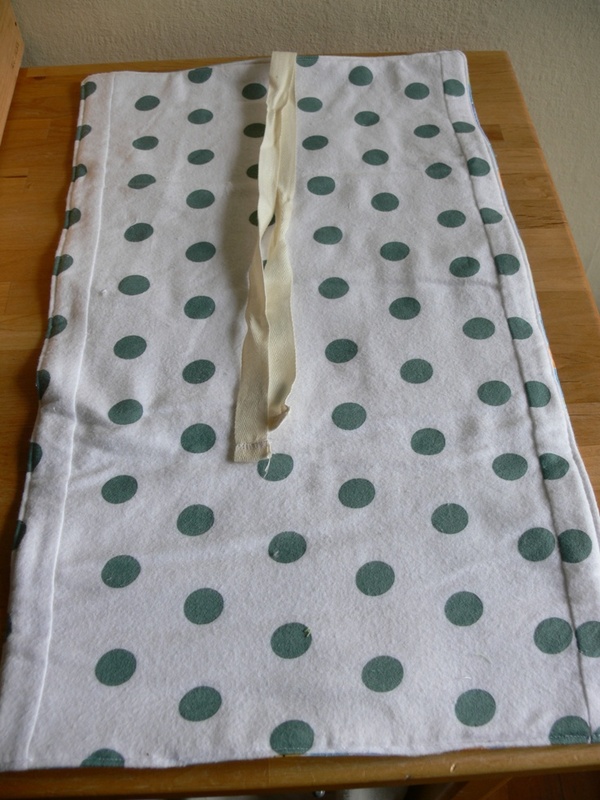 I found a light sage green and white striped print left from Ben's nursery linens. It seemed appropriate! 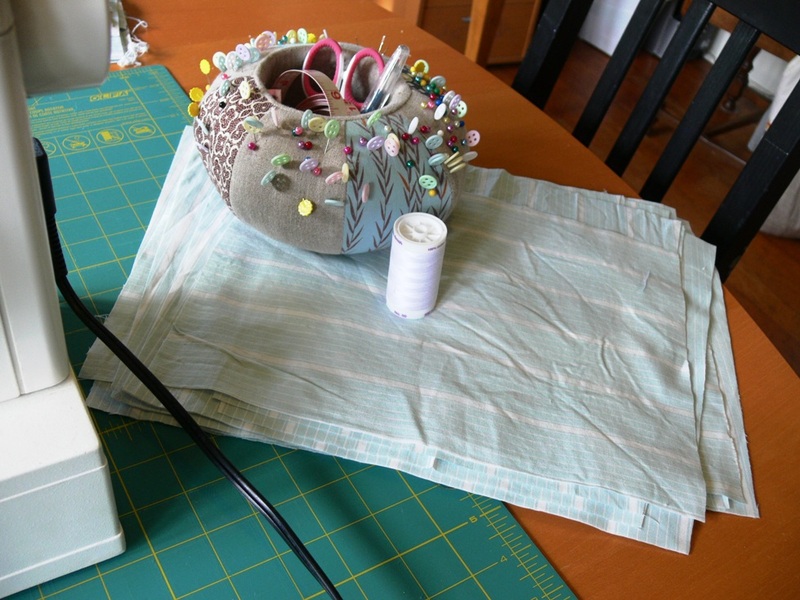 Plus, there was more than enough yardage (I ended up needing 2.5 yards). The assembly was pretty straightforward, I sewed all the side panels to the bottom, then stitched the seams along the 4 sides. 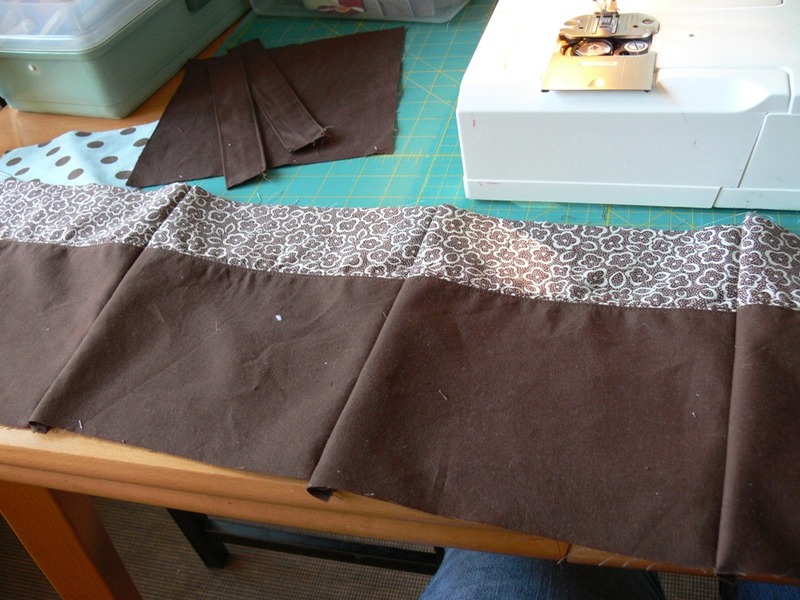 When all 4 liners were assembled, I hemmed them at the top, leaving a 1-inch gap. 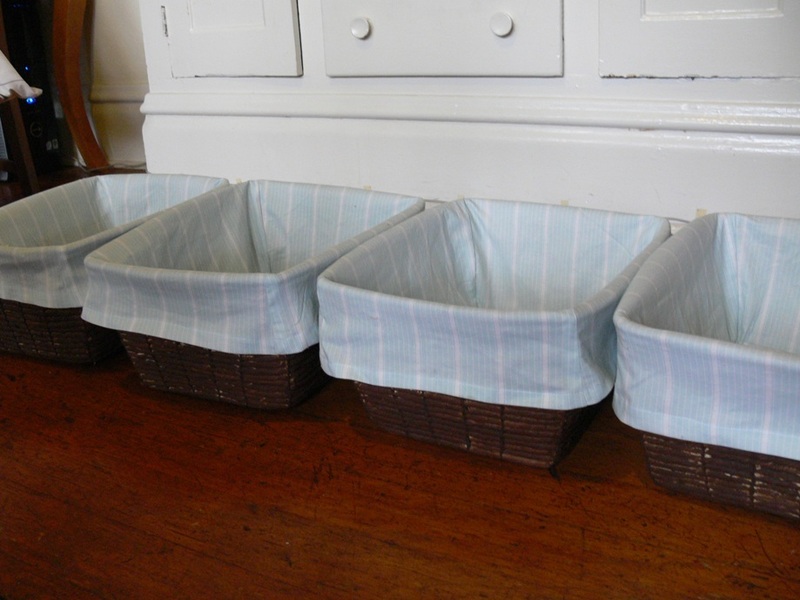 I tested the liners in the baskets and they fit fine, aside from the borders looking a bit like little skirts. Time to put in some elastic! I threaded it with a safety pin through that 1-inch gap. Oh, the pre-baby nesting! I love it. 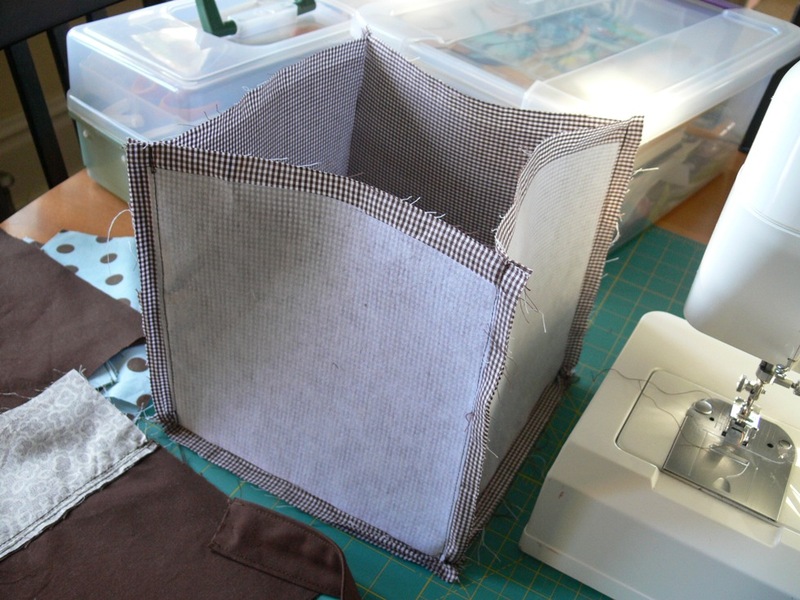 I think this is the absolute perfect project to do three weeks before the baby is due: straightforward, simple to complete and practical to boot! What other crafty projects do you need to do before he gets here?